i purchased the recommended trailer plans for the gypsy so i have some good information on how to build a trailer. but not too sure exactly how to build a trailer specific for gypsy houseboat. optimal trailer height is ? when considering 15" wheel + tandum fenders? should trailer have 6" V .. or horizontal cross members? 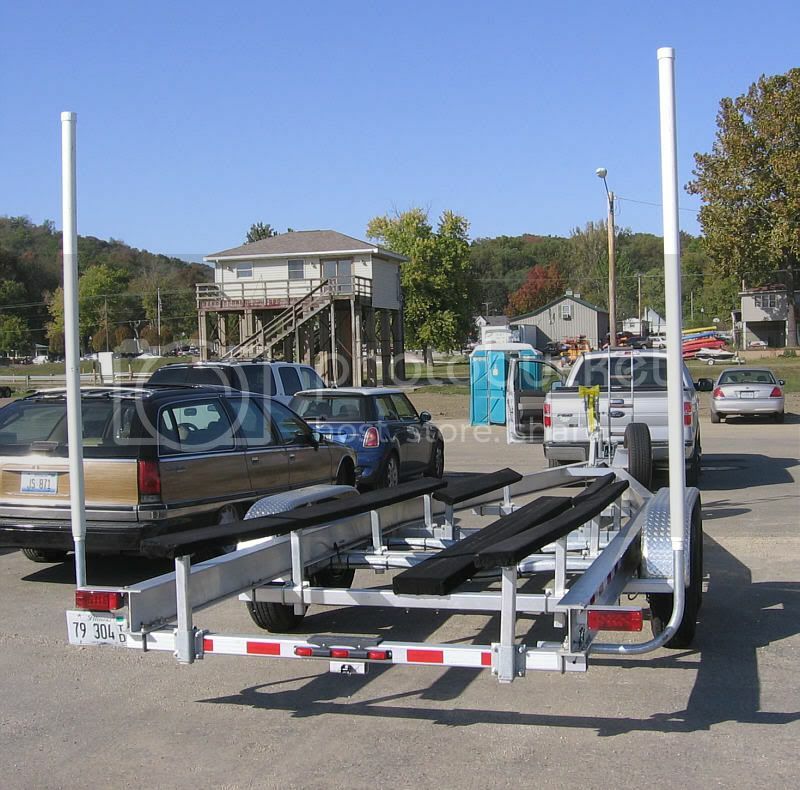 if lower is better, at what width does the trailer have to be in order to avoid hitting the wheel (i imagine this boat with its 8' beam will ride on top of the trailer wheels). In your situation I believe the hull will have to be placed over the wheels and fenders. The fender height will then dictate the height of the hull on the trailer. I am thinking the Gypsy has a fairly shallow "V" so most likely straight trailer cross members will work but you will need to verify this. When building my trailer I made some templates of the hull bottom shape at different stations. There were nothing more than strips of scrap plywood screwed together. The were then set on the base trailer frame and used to determine the angle of the bunks. Take a look at the photos on the link below. I think it will give you a better understanding of what I am trying yo describe. hi raymacke, actually i have read your web page a lot already! that's where i learned about how to fab your own V-shape trailer.. i was originally going to make it just straight across. from easternmarine.com i see the longest axle they sell is typical 88" track length (tire to tire) which if i remember is a bit smaller than the gypsy which is 84" wide. so gypsy will be above the tires. gypsy has a 9" V, so i think that is not too much? if the trialer has matching 9" V.. with 3" bunk.. then it will sit a total of 6" below plane. but the shape of the boat, as per the boat frame plans, will mean it is a what height by the trailer tire? that's the key part i suppose..
ya, you're right that's the way i'll have to do it. i'll wait to determine what height the bunks need to be installed until after i'm done building the boat.